Beervana Buzz: Cheers to Mitzi! Those of us who enjoy great beer are often quick to credit the brewers who develop the recipes and execute the production details. It's well-deserved. We get a kick out of meeting these folks and listening to their wisdom. Too often overlooked in our pursuit of the best beers are the people who provide guidance in finer stores and bottleshops. A lot of people assume this is an easy job. Not so fast. Working with the public in any retail setting is an art, requiring knowledge, patience, a sense of humor and a lot more. The beer setting is no different. 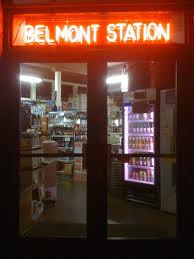 I've bought a fair amount of beer at Belmont Station over the years. Great store. The person I relied on most often when I had a question was Mitzi Komisar. Never mind that I didn't know Mitzi's last name until recently. She always gave good advice and conversation. And she knew whenever I arrived with empties that I wanted my tattered old Deschutes box back. I just learned that Mitzi worked her last day at the Station on March 23. She's decided to actively pursue her acupuncture business. I guess that's probably her true calling...I hope it is. Because I know I will miss the conversations about beer and other things. I know I'm not alone. Belmont Station is honoring Mitzi's contributions to the business and it customers on Friday, April 13, from 5 to 11 p.m. I'm looking forward to that event and hope to see a good contingent of beer people there. Cheers, Mitzi. We wish you well.